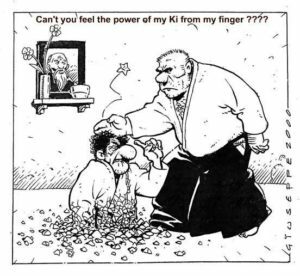 I think we have all had that experience of the dojo ‘gorilla’ striking to injure or grabbing our wrist so that our hand turns red and then varying shades of purple! It’s discouraging and we wonder if we are really learning a martial art when it’s so difficult to perform the technique we are meant to be practising. So what’s going on? Aikido is a martial art based on koryū (literally, ‘old school’) principles and therefore does not encourage competition such as sparring. One disadvantage is that there is no external measure of whether or not aikido works. This was fine in the founder’s time because he was travelling around Japan taking on all manner of challenges. But fast forward to today and it’s harder to satisfy ourselves that ‘the art of peace’ really works. Sometimes a form of competition arises in the dojo and the ‘grip of death’ appears from a student wanting to satisfy themselves that the art works. The trouble is this can become habitual and the death-gripper has to be convinced over and over again. The learning environment is often the first casualty, so this practice becomes self-defeating. So please Mr Gorilla-grip, satisfy yourself that the art works once, and then get on with learning the art so you can be better at it! 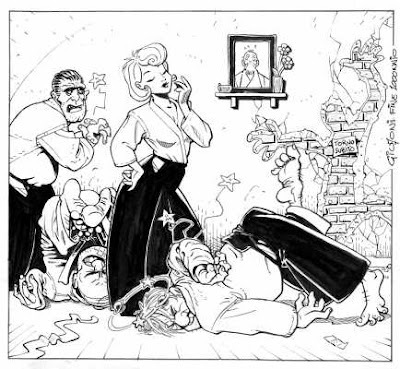 Humans like social hierarchy and at the basal level social dominance is exerted through physical displays of mock violence. If you want to prove you are better than someone and you know what their next technique is (because that’s the one sensei said to do) then it’s easy to grip hard and block. Great stuff! You’re stronger than me … now, can we get on with learning aikido please? In the dojo of old you were training as part of a clan or village, because the very next day you might be doing battle with the clan over the next hill. In this environment it makes little sense to block another person’s technique constantly. Your training partner and you are on the same side, why not spend your time helping them get better rather than blocking their technique? What we generally think of as techniques aren’t techniques at all. Instead they are kata, basic shapes that draw on specific principles and let us practise certain movement patterns over and over again in order to experience ‘aiki’. Think of a 20-step karate kata and imagine someone stepping up behind the karateka at move 15 and bopping them on the head to ‘prove’ that karate doesn’t work. This is exactly what is happening when uke grabs to defeat. Aikido kata have a number of phases including: contact, unbalancing, entry, moving in harmony and a throw or pin as resolution. One person, nage, is learning to implement these phases effectively, the other person, uke, is learning to survive them. In this sense the best defence is not to block or resist: that’s actually dumb on a battlefield where everyone has a metre-long razor blade in their hands. As uke you are learning to move ahead of a technique without resisting, while providing sufficient challenge to your partner that they are able to improve their performance at each repetition. In combat sport, women and men compete separately in weight divisions against people of similar ability. A 150 cm, 50 kg woman is never matched against a 190 cm, 130 kg man. But in the dojo we can have exactly that kind of match-up. It takes time for smaller, slower, older or weaker people to realise the mindset and capability to prevail against younger, faster, stronger and larger opponents. But this is exactly the point of aikido training. If we progressively increase the challenge we give to our partner we quickly find that we run out of challenge before they run out of aiki. So given that practice is a set aikido kata, if your partner wants to depart from that by not practising the receiving part (uke), it’s not going to be a productive time. You might persevere with the kata or you might treat it as free play and practise a different, unanticipated kata or you might practise your atemijutsu (striking) instead. All of these responses have value. 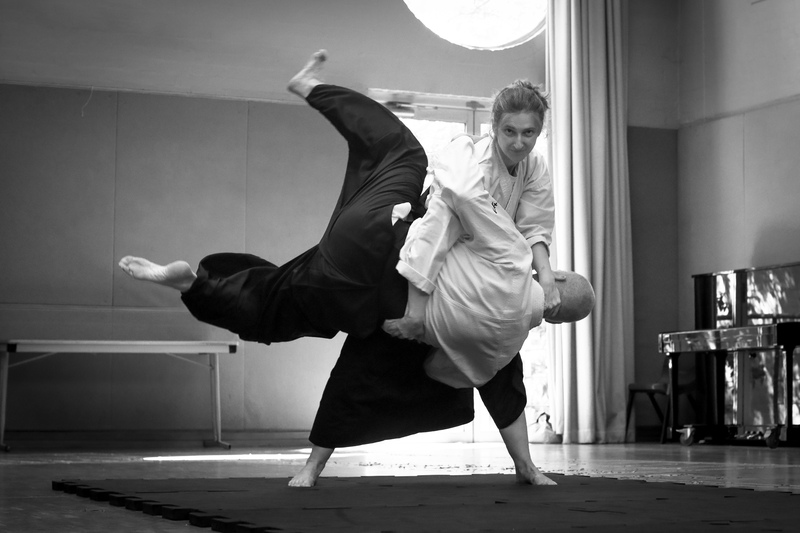 A frequent criticism of aikido is that it’s choreographed, with people throwing themselves around. The uke–nage dynamic is a precious thing. Uke must neither give too much resistance, nor just throw themselves for the sake of it. It’s for this reason that in koryū schools the teacher is always the uke, providing just enough challenge for nage to improve but not so much so that they fail. This is called error-free learning and it’s at the heart of elite athletic development. Early in his career, Tiger Woods hit 100s of golf balls into the night, not knowing where they landed. This enabled him to practise the mechanics of his art without being attached to the outcome. So take a leaf out of Tiger Woods’s book and practise for success. Uke, stay out of the way! Next time you get the grip of death, just tell your partner they are too strong for you and ask them to ease up. If they don’t want to help you learn, well, find another partner. Life is too short for inferior practice. In time strength becomes much less relevant. ← No-touch aikido, yes it’s real!